Valentine’s Day is just around the corner, so we’ve rounded up some great craft ideas to help you get ready! These Valentine’s Day crafts include a little something for every age and skill-set. 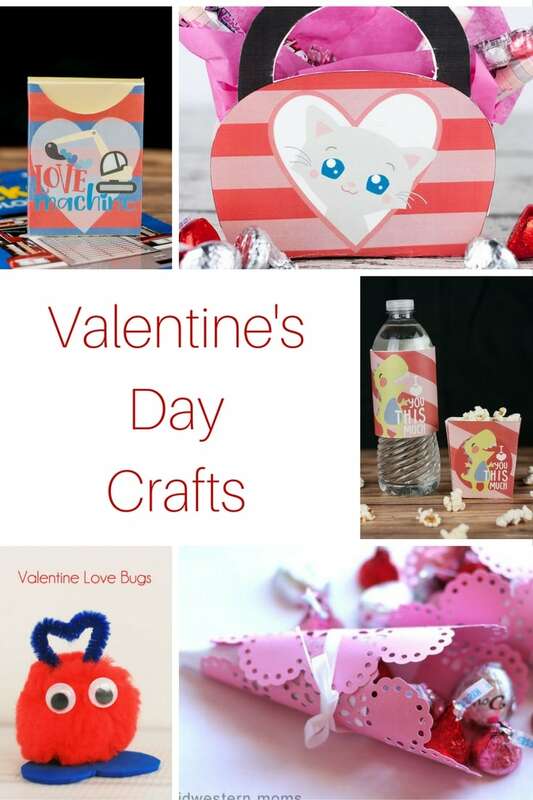 Whether you are looking for some great party printables, crafts you can play with, or keepsakes you can make together as a family and enjoy for years to come, help make this Valentine’s Day special by creating something together! All you need for this cute craft is card stock, glue dots, ribbon, and scissors, and you have yourself a great wreath for Valentine’s Day. You can’t go wrong crafting with googly eyes! The kids will love this simple Valentine’s Day craft. This is a fun craft that you and the kids can make together! It wouldn’t be Valentine’s Day with Cupid and his Arrows. Make these cute rustic arrows to add to your decor. Learn to crochet a heart and make a garland that you can hang for Valentine’s Day! These card stock cones are perfect for holding goodies to pass out to friends. Here’s a great holder for all of your Valentine’s treats! Super cute printable design. Water bottle and snack favor boxes featuring a dinosaur design will add to your Valentine’s Day party decor! Such a cute way to gift crayons to your child’s class, or friends! If you know how to crochet, this headband pattern is adorable! Cute paper headbands to make with the kids! This post has a lot of other activities for kids to enjoy. This kid’s craft uses a toilet paper roll to create a cute bee! Another great children’s activity! Love these heart ornaments made out of salt dough with fingerprints! A great keepsake to enjoy for many years. A fun project for the family, these yarn hearts are adorable to hang in the window. Great craft idea for a teenager for Valentine’s Day. This washi tape frame can be made for just $1. Looking for a fun Valentine’s Day craft for adults? This would be a great project to do when you get together with friends! Loving this quick craft project for giving away gift cards for Valentine’s Day. I have a few people on my list I love to gift coffee to, so this will be perfect! This adorable craft makes a wonderful gift for a loved one that your entire family can participate in! Another great idea to get the entire family involved on a keepsake that will last a lifetime. These floating heart glitter jars look so much fun to play with! Loving this windsock craft for Valentine’s Day! Get the entire family involved in creating and playing with this craft for Valentine’s Day. What craft are you most interested in making?